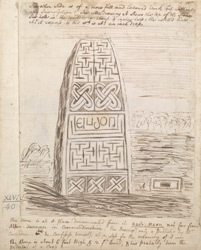 Sketch of the Cross of Eiudon in Golden Grove, Wales. Inscriptions on stone monuments such as the one sketched here are important to help us to understand Celtic religious life. Most of the inscriptions are on funerary monuments and memorial stones and identify members of the community such as Kings and Saints. This is a fairly typical example of a Celtic stone cross- the area containing the decoration has been divided into separate rectangular sections and there are good examples of the distinctive Celtic knotwork patterns. Simpler monuments were constructed from one single piece of stone but those that are more developed are made from separate pieces joined together- in this instance the cross from the top of the monument has been lost.